Changing the way therapists do business! We are in the process of getting these courses built out and approved for CEUs by AOTA and proCert. In the meantime, check out our resources page for materials aimed at increasing your clinical knowledge and grow your practice. 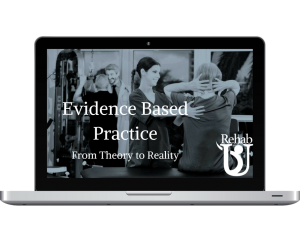 You can also head over to our Blog to read our latest articles covering everything from evidence-based clinical info to tips and strategies to grow your practice and improve patient experience. Sign up here to get alerted when these courses are published and available! You’ll also receive clinical bonuses not posted to the site! We are on a mission to radically change the way therapists do business! We want to help our clients break out of the cookie-cutter paradigm that leave them burned out, stressed out, and wanting more for themselves and their patients. We approach each of our clients with fresh eyes to develop customized, unique strategies to improve patient experience, engagement, and outcomes. We want you and your patients to love what you do and value the skill and knowledge you bring to the table. ©2017 by Rehab U Practice Solutions. Salazar Enterprise, LLC.